Cycle a combination of dirt roads a tarmac, take traditional boat rides, explore hidden villages, discover historical sites and national parks in Northern Vietnam, ride in the hustle of Hanoi and then relax on a Halong Bay Cruise ship. Departure is guaranteed with 4 people. Max group size is 8. Meet with our team for a short sunset ride around Luang Prabang to ensure we are confident for the journey ahead and to get acclimatized to life in SE Asia. We will have a informal trip briefing and dinner at a local vocational training restaurant. We begin our exploration of northern laos well off the beaten track interacting with the rural Hmong and Khmu communities of Northern laos, Dirt road riding over rugged terrain on a road rarely used by tourists. 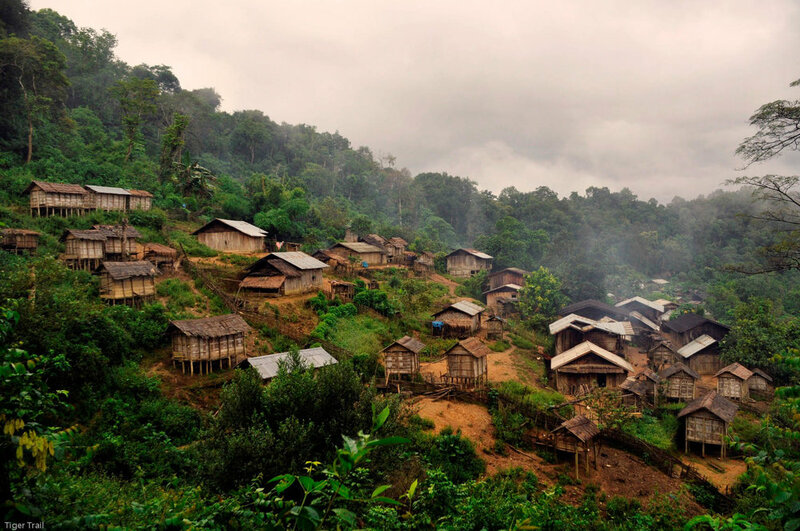 In the small village of Pakxang we meet our host family and spend the night in there home for a real Homestay experience. This day will probably be the most challenging of the tour, But rewarded with the best views and pristine jungle landscape. Today you are truly rewarded for your efforts a great up and down days cycling to back packer haven of Muang Ngoi, This route take you well off the beaten track and into parts of Laos that have only just got electricity. Muang Ngoi nestled deep in valley surrounded by stunning limestone peaks. You have the afternoon to do as you please. The Bikes get put a traditional long boat for the beautiful trip up the Nam Ou river, we will stop for a picnic lunch on the way as we gently put-put our way up stream. The Ride to the Vietnamese border is straightforward and an easy ride over mountain passes. We will arrive at around lunch time ready to cross and meet our Vietnam team and a 1 hour transfer to the Historically significant city of Dien Bien Phu take the afternoon and evening to explore this beautiful and fascinating city. Cycling from Dien Bien Phu to Tuan Giao is an easy 80 km through many Tai ethnicity villages to Tuan Giao (one notable climb is a mountain pass 15 km outside Dien Bien). Overnight in a guesthouse. Cycling from Tuan Giao to Son La. After a short transfer to the Pha Din pass (“Heaven and Earth” pass) to the summit of 1450 m, you will start the day with a 15 km down hill featuring a nice landscape of green rice fields and karst valley along the way. This stretch has light traffic, wandering water buffaloes, and Tai and Hmong children. Overnight in Hotel. After a short transfer, our day will be less hilly but no less spectacular, as we head off gradually downhill, our passage overshadowed by looming karst cliffs. After lunch, we'll continue through lush, terraced rice paddies against the jagged cliff backdrop. After a hearty breakfast we set off on a testing but spectacular day. Cycling along a narrow, quiet back road we'll head into a region predominantly populated by Black Tai (Tai Dam) minority cultures. As we near Mai Chau, situated at 1000m, we pass through plum orchards and corn and tea plantations. Overnight in homestay. Following the banks of the Ma River, this day will be an easy easy one. The scenery, however, is timeless and photo opportunities abound as you pedal through a working landscape of people and crops. In the late afternoon, you will get a transfer to Cuc Phuong National Park. Cuc Phuong is one of Vietnam's most important nature reserves and contains the country's largest area of primary forest. Visit the Primate Rescue Centre and learn about the plight of endangered species such as the Cat Ba Langur. Overnight in Bungalow. Ride the final leg to Hanoi. The ride is 40 km through Cuc Phuong forest to the park center and break for tea before taking a transfer to Hanoi. We will pick up at the hotel and transfer you by shuttle bus to what is considered to be on of the greatest sites in ASia the spectacular Limestone strewn massif of Halong Bay. Arrive in Ha Long city, board our traditional wooden junk boat, for an overnight journey. Sip on a refreshing welcome drink upon check in before you begin your cruise through the Bai Tu Long Bay, the wildest beauty with the panoramic natural views. Admire the grace of the bay while enjoying the delicious lunch in the restaurant at the first deck. After that we explore the well-hidden Co Cave (known as Thien Canh Son Cave). Relax on white sandy beach or walk along the beach at Hon Co Island (no swimming). At the end of the day, enjoy the sunset with evening cocktails and fresh fruit. Take an opportunity to refresh and then join friends for a pre-dinner drink in the bar. Dinner is served in the restaurant or outdoor dining area, which is a gastronomic delight. After dinner, unwind in the bar where there is a selection of books, magazines and board games or relax in the spa, join some of our team to go cuttle fishing at night. For the early risers join us for a Tai Chi session on the sun deck. Tai chi helps focus the mind and condition the body and there is no better environment to practice this than amongst the limestone peaks and islands. Take an opportunity to view the sunrise over the bay or have an early morning swim. Breakfast, coffee or tea is served. After breakfast we transfer to the Day Boat and start cruising to admire the great beauty of Bai Tu Long Bay. Kayaking in Cap La Area - Deep into Bai Tu Long Bay, the area is full of the famous hidden lagoons covered by majestic limestone islands and islets with small beaches. A BBQ lunch will be served on boat. After lunch, we continue kayaking around magnificent karst mountains or swimming (depending on conditions). The vessel cruises back to your overnight boat. Dinner and overnight on junk boat. For the early risers join us for a Tai Chi session on the sun deck. Tai Chi helps focus the mind and condition the body and there is no better environment to practice this than among the limestone peaks and islands. Take an opportunity to view the sunrise over the Bay or have an early morning swim. Breakfast, coffee and tea and served. After breakfast we sail through the waters and explore Vung Vieng Fishing Village and short visit the Pearl Farm to learn how natural pearls are grown. We will then check out the cabin and enjoy Vietnamese cooking class and set menu lunch follow by. Cruise back to Ha Long city for disembarkation where you take a shuttle bus to be back to Hanoi. A Free final Evening at leisure and overnight in Hanoi. Today you are free to explore Hanoi at leisure until departure time.